Are you interested in developing your innovation skills and learning to innovate at a higher level? We have a number of short innovation courses designed to guide your through learning innovation by working on a challenge important to you, your group, or your organization. The practical and innovative seminars will help you to be more entrepreneurial in your work. Remember, we learn best not by just reading or listening. So if you want to maximize the learning you can get from an online workshop, course, or seminar…make sure it isn’t just composed of reading materials, lectures that are just someone speaking, or tests or quizzes. We learn the most from watching and doing for ourselves. Try to do innovation courses or workshops that guide or facilitate you through a project that you get to pick yourself (not a general example that you have to do that you may not be interested in). Make sure the course instructor is demonstrating the activities so you can see and do for your own project. Check to make sure the courses or workshops you do are more active, experiential, project-based, and allow you to work on your own challenge for your work or life. Our goal with our courses is experiential learning in nature. We want to walk you through reflections to think about and activities to do so that you can work on your own innovation project…creating and developing ideas for a challenge that is real to you. We show you examples along the way and provide tools, techniques, and exercises with a purpose…to help you innovate. The online innovation courses can be done on your own, with a group or organization, or as a part of a larger innovation or leadership program. We can also do the online courses live for your group…either online as a webinar or in person as an experiential, engaging, and interactive innovation workshop. 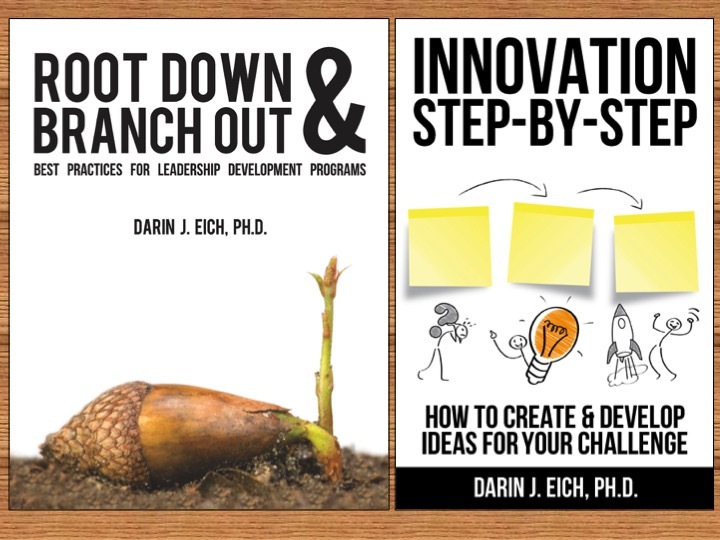 Most of our courses and workshops are based on a simple model or system for innovation that you will learn from the book Innovation Step-by-Step: How to Create & Develop Ideas for your Challenge and grounded in best practices for leadership development programs. Many of us didn’t have the chance to learn innovation in school or on the job. Innovation courses can help to fill this knowledge gap in a simple and efficient way. It is important to always be developing our skills in life…to be innovating and not stagnating. Staying sharp through cultivating our creative thinking skills can be beneficial…both divergent and convergent thinking. Skills like innovation, creativity, problem solving, critical thinking, collaboration, and communication are what employers and society needs most in our era of constant change. We can develop these skills through real experiences…innovating, creating, solving problems, thinking critically, collaborating, and communicating. Innovation courses allow the guided experience for you to do this…through working on a real project for a real challenge that you choose. The innovative courses will lead you through activities and a system for development.